Marketing has a task of creating curiosity in a brand, whereas designing is what communicates that brand. For any organisation to function properly, marketers and designers are equally important. Both of them have the same goals it’s just that they have different ways and perspectives towards it. In marketing there are factors such as content or copy, translations, guide, conversions and brand tone, whereas designers focus on factors like visuals, purpose, experience & emotion. Both are concerned about the ultimate goal, it’s just that they use different tools for it. By working together the organisation can communicate, strategise as well as plan together. Both the teams unite around the idea of performance which aligns designing and marketing teams to solve problems together. Marketing consists a clever copy and targeting, that needs to perform. Similarly designing can have a beautiful land page and interactions which needs to convert and engage consumers. For this the relationship between Designing and Marketing is of utmost significance. Marketing is an agenda to deliver an experience and design is the act of building the delivery mechanism for it. Marketing includes research specifically to uncover requirements and designing is driven by an intention to meet them in a pertinent way. 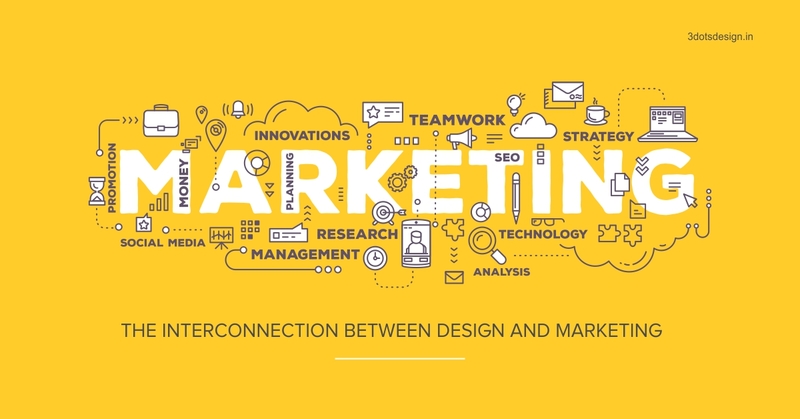 One way to define this relationship is, Marketing and designing are two sides of the same coin and the thing binding them is requirement of the consumer. Designing too partakes in consumer research in fact a lot of their advance strategic activities are quite similar to marketing. When both the disciplines put fourth their viewpoint tremendous value is created. An essential aspect of designing is the visual part whereas marketing has copy. If the question pops up, whether the copy is important or visuals, then the answer would be – the message, the communication is important. The product should reach out to the customer. So the collaboration of Marketing and designing is crucial. 3 Dots Design which is the Top marketing company in Pune has time and again been successful in bridging the gap between the clients and the customers. The right features of the product should be presented through the right medium to the right target buyers. As the main agenda is ‘sales’. Marketing briefs provide inputs or platform for designing and designing accentuates the presentational together. The market insights derived from the research by both the disciplines, i.e. designing and marketing teams should be able to deliver to the customer. 3 Dots Design is the Top branding agency in Pune that utilises both designing and marketing in the best way to cater to the customers. Over the years, we have built a team of seasoned professionals that has the ability to create clutter-breaking advertising for clients. The 3 Dots Design squad has the ability to empower seamless 360 communication solutions for all our clients, across categories. The team takes pride in partnering with the clients in their challenges and glory. The leadership at 3 Dots Design is a composite of professionals, each with an average experience of 15 years which makes it the Top design company in Pune.